We’ve been staring at this guy’s backside for the past hour, and are now more confused than ever. 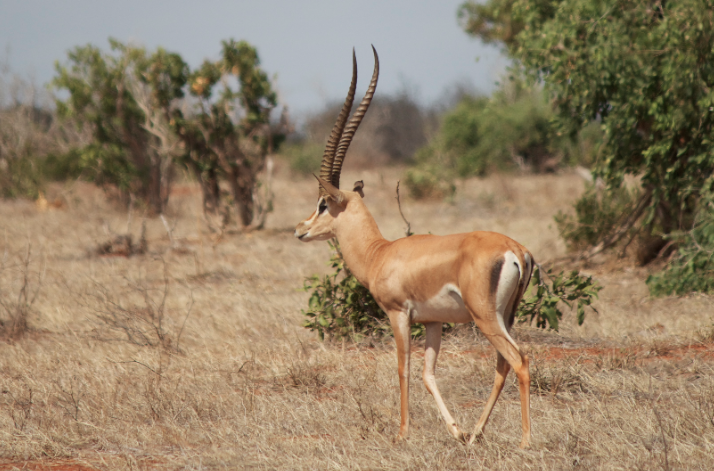 We came across this trophy animal in Kenya’s spectacular Tsavo East National Park, and snapped him because he had the most incredible horns we’ve ever seen on a Grant’s gazelle. Or an impala. Or a – well you see, that’s the problem: we don’t quite know what he is. The horns are classic Grant’s gazelle, but the markings on his rump – particularly the white – look more like an impala. Can anyone help us identify this handsome fella? We’re wondering if anyone ever came across a hybrid… could we call him a granpala? Or perhaps a gazella parallelworldia? Mark and Narina recently spent a month travelling Kenya. See more posts from their trip here. South Africa’s top animal photographers. Previous article“Fear and loathing” in Lamu?